Daily Forex Analysis – April jobs report will be the market mover today and could potentially dictate the short-term direction in prices. While gold, EURUSD and USDJPY have all recovered from their recent strong moves, a short-term pullback is likely on the cards as gold continues to remain bullish and could eye 1290 while EURUSD sitting at the 1.14 key support could see a rally back to 1.1490. EURUSD (1.14): The continuation following the reversal near 1.16 has sent the EURUSD to 1.1405 lows right near the support level of 1.14 – 1.1380. Resistance is seen near 1.15195 – 1.15975, which could see a bit of a retest if the declines manage to hold at the current support level. On the 1-hour chart, we see a bullish divergence, which when combined with the price at support, signals a move to the upside. However, this could potentially form a median line failure, which will eventually see EURUSD fall back lower. A break below 1.140 – 1.1380 could see EURUSD push lower to 1.1217 – 1.1143. 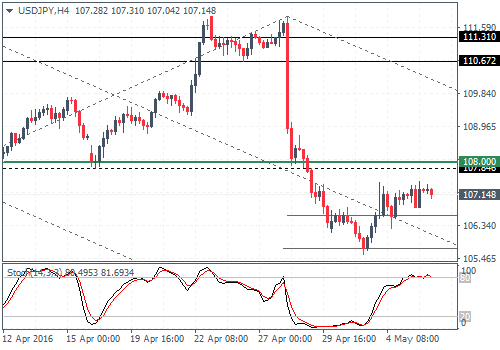 USDJPY (107.1): USDJPY has managed to push higher and is now closer to the resistance at 108 – 107.85. If price action doesn’t rally higher to test this resistance, we could potentially expect to see near-term declines on the card, as seen by the hidden divergence on the 4-hour chart. USDJPY could fall back within 106.58 and 105.70 levels ahead of further upside. A potential break above 108 resistance could pave the way for USDJPY to test 110.67 – 111.31 resistance. GBPUSD (1.44): GBPUSD closed with a doji pattern yesterday and today’s price action could be decisive. 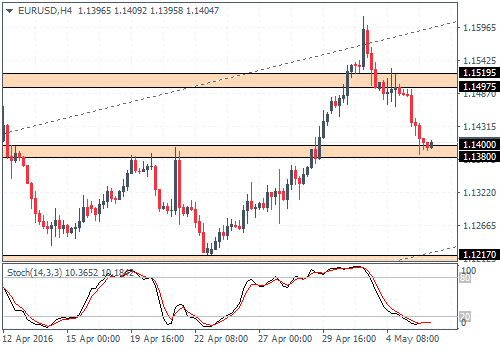 A bullish close could see GBPUSD move towards the previous April 28th highs above 1.4635 or a bearish close below the doji low could see the support at 1.4425 being broken for a test to 1.420. 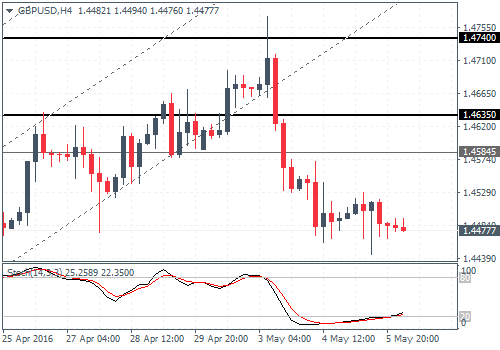 On the 4-hour chart, with the brief test to 1.474 resistance, GBPUSD eventually broke down below 1.4635 – 1.45845 minor support/resistance and could potentially move higher to test this broken support for resistance ahead of a decline to 1.4312 – 1.430. A bearish close on GBPUSD today below the doji’s low could signal further continuation to the downside towards 1.420 and eventually to 1.415 – 1.41265. 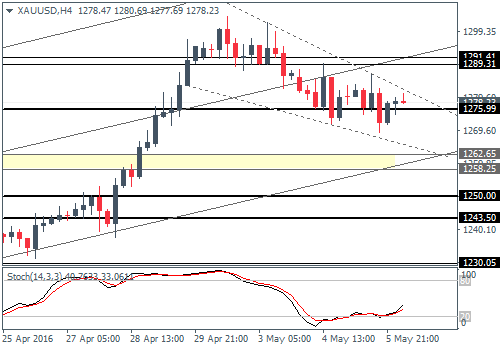 XAUUSD (1278): Gold prices have eased back on their momentum with the past three candlesticks closing in a small bodied pattern, This could potentially indicate a risky move in the near term. The 4-hour chart shows a possible bullish pennant continuation pattern which could spell further upside in Gold, but subject to price action clearing above 1291.41 – 1290 level which is likely to be tested for resistance. A bullish breakout here could see gold position itself for a stronger breakout potentially breaking above the 1300 handle. Alternately, failure to clear the resistance at 1290 – 1291 could see a failed pattern, that could open up the downside risks for a dip to 1262.65 – 1258.25. Please be aware the market is expected to be volatile as the Non-Farm Payrolls will be published at 12:30 GMT. The expectations for today are 203k, a reduction of 12k on the previous month\'s 215K figures.